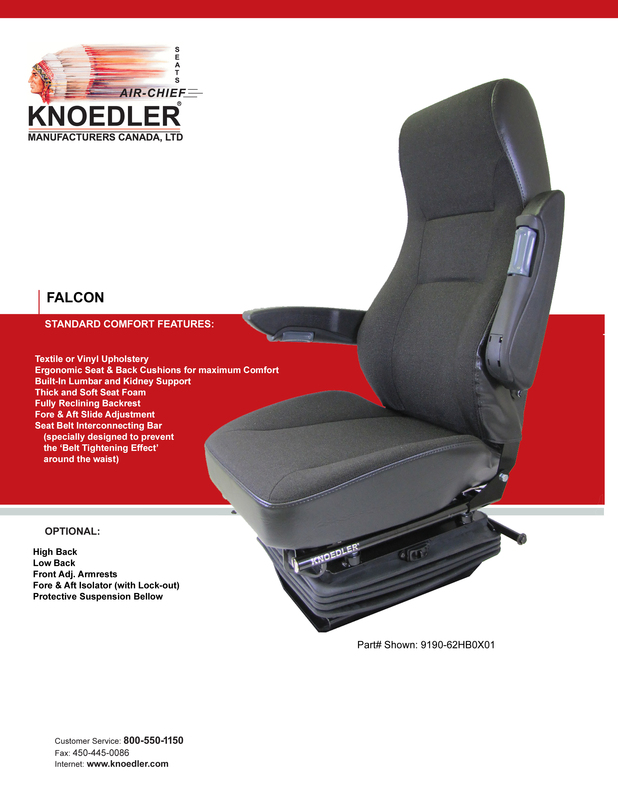 Designed for short or long hauls with Knoedler's Poly-Dynamic air suspension . 20.5" Contoured seat cushions with ample foam and elastic "K"-webbing for a super soft ride. Improved performance as both directions of the suspension are coherently integrated and therefore work together. As the ICP's (Inter Connecting Points) of the lower 2 Seat-Belt-points move with both the suspension and the isolation movement during normal operation. Therefore there is no relative movement of the seat belt in regards to the body. This drastically improves the seat belt wearing experience and gives the opportunity for full use of the seat belt system. This system helps eliminate the "belt tightening effect" that is typical with "detached / separate" isolator mechanisms.